Nobody could dispute that South Carolina’s Inland Port Dillon is perfectly located. Just a mile from the I-95 interstate highway, there is also direct access to the Port of Charleston via rail, which in turn opens up an abundance of opportunities for international markets. Additionally, the port is located near the junction of mainline north-south and westbound rail lines servicing markets in north-eastern and mid-western centres, including Chicago, and is a mere 30 minutes’ drive from the I-20, serving markets as far west as Dallas. 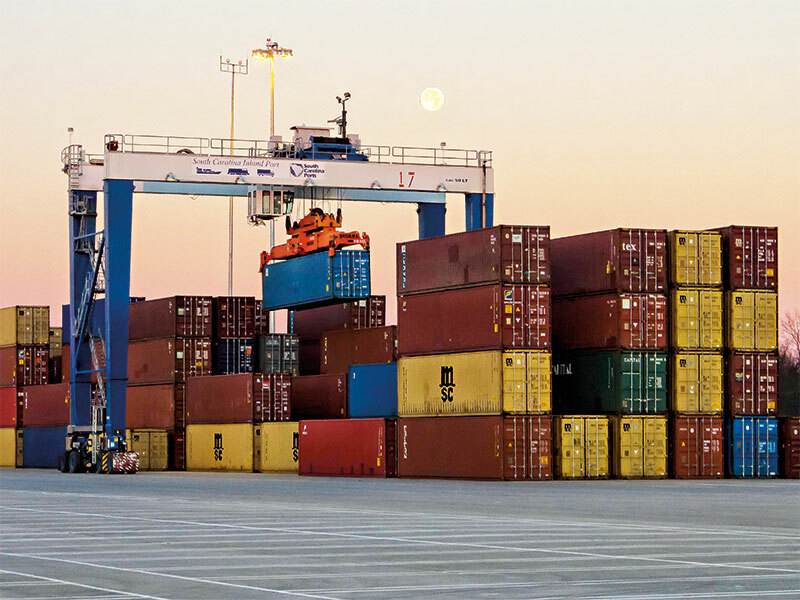 Inland Port Dillon will serve as a point on the CSX intermodal network. The facility will ground containers, have an adjacent chassis yard, and will be a point for termination and origination of empty containers. Rail cars will be double-stacked with containers and sent to and from the inland port on a daily basis, resulting in a reduction of transportation costs for companies located in the vicinity of the inland port facility. Shippers to the inland port will enjoy the convenience of scheduling shipping to and from the port in the same manner they already schedule shipping to and from major seaports. Empty containers and full containers for import or export may be received at the inland port terminal as well. This facility will utilise the latest available technology to securely track and move cargo, ensuring cargo security and on-time shipments. For international companies seeking to establish a US presence, but who refuse to pay the high costs of land near a seaport, Carolina’s I-95 Super Park adjacent to the port is an opportunity to have the same luxuries at a lower cost. The site, offering over 3,400 acres, is an ideal location for trans-load, cross-dock, distribution and manufacturing facilities that require a near-port location. It offers an average land cost of $15,000 per acre, and a site that is fully equipped with transmission and distribution grade electricity, transmission grade natural gas, an excess of water and wastewater infrastructure capacity, and a telecommunications infrastructure. The North Eastern Strategic Alliance (NESA) region, in which the port resides, also offers an average land price of $17,000 per acre at nearly 100 different industrial sites throughout the region. There are also more than 30 industrial buildings available throughout the region with an average price of $16.76 per sq ft.
With a population of nearly 2.2 million and an available workforce of nearly a million within 60 miles of the region’s geographical centre, NESA has a very robust labour pool to draw from. Employers use the region’s productive workforce to churn out all-terrain vehicles, pharmaceuticals, food additives, frozen meals, steel, packaging products, and much more. The region is home to companies that engage in worldwide distribution, and are on the cutting edge of their highly specialised fields.